Many plants still operate with a "run to failure" maintenance strategy. In this mode, no actions are taken until machinery fails; the maintenance staff runs from one disaster to another. Maintenance costs and production losses are high. Some companies have transitioned to preventive, or calendar-based, maintenance. Actions are scheduled regardless of the actual condition of the equipment. With this approach, fault-free machines can be repaired unnecessarily, leading to higher program costs. Over the past 30 years, the US Navy and many Fortune 500 companies transitioned from preventive maintenance to condition-based maintenance. 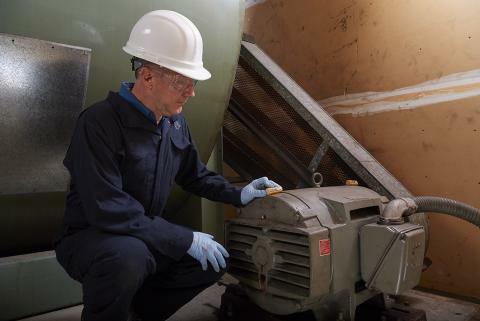 With condition-based maintenance, machines are measured with methods such as vibration analysis, which don't require tearing a machine down to find out its condition. When a machine condition fault comes up, a repair is scheduled when it's needed - not before and not too late. Several technologies are used to measure and diagnose machine health. Two of the most important are vibration testing and infrared thermography. The graph shows how you can detect changes first with vibration testing, then with infrared thermography. Only later on - shortly before machine failure - can you hear audible noise and feel heat. Predictability. 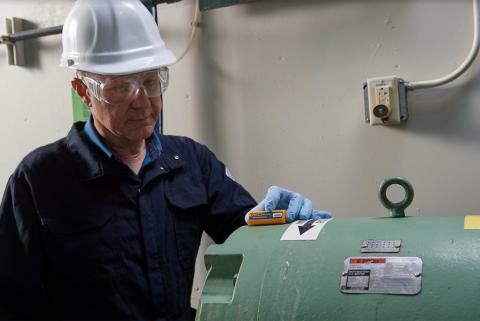 Give maintenance staff time to schedule required repairs and acquire needed parts. Safety. Take faulty equipment offline before a hazardous condition occurs. Revenue. Incur fewer unexpected and serious failures, helping to prevent production stoppages that cut into the bottom line. Increased maintenance intervals. Extend life of equipment and schedule maintenance by need. Reliability. Incur fewer unexpected or catastrophic failures because problem areas can be anticipated before failure. Peace of mind. Build confidence in maintenance schedules, budgeting, and productivity estimates. All rotating equipment generates a unique vibration signal or signature. These unique signals are usually captured in series, with the signal's amplitude (y-axis) depicted over time (x-axis). This is called a time waveform. The waveform contains information about the machine at the point of measurement. Vibration comes from the rotating shaft, adjacent machines, foundation, noise, rotating components, structural resonances, flow turbulences, and other sources. However, the patterns of different events are overlapped and jumbled together. Separating and isolating one vibration signal from another is complicated. Frequency analysis performed in the data collector simplifies the waveform into certain repetitive patterns. Fast Fourier Transform (FFT) is a mathematical algorithm performed by the vibration testing tool to separate individual vibration signals. Spectrum is the plot of each of these individual signals on a simple plot of amplitude (y axis) against frequency (x axis). We can simplify it down to a three-step process. 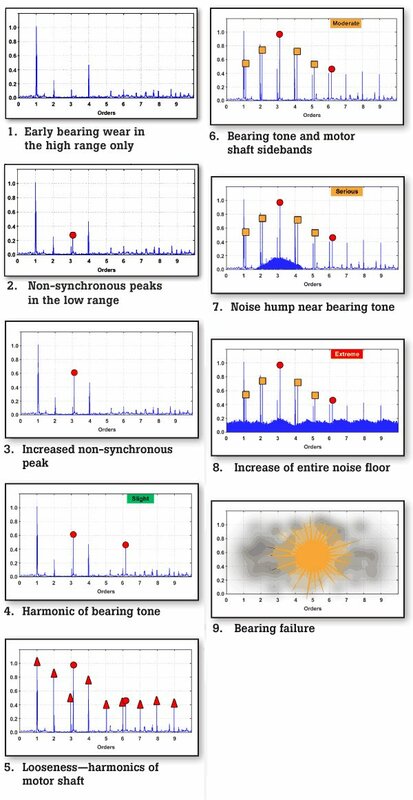 Identify vibration peaks as they relate to a source component on the machine. Look for patterns in the data based on vibration rules. Measure the amplitude of the vibration peak to determine the severity of the fault. Once the fault and severity are determined, you can recommend a repair and generate a work order. A study conducted by the SKF Group tracked the life of 30 identical bearings and found that there is a wide variation in bearing life. This precludes the use of an effective calendar-based maintenance program. A roller bearing - also called a rolling-element bearing - carries a load by placing round elements between the two pieces. Most machines today have roller bearings. The graph shows an example of data with a bearing fault. Notice that the vibration peak from the shaft is at 1 times the shaft speed (1,775 RPM). Four pump impeller vanes and seven motor cooling fan blades are within the system. A large vibration peak occurs at 3.56 times shaft speed. It cannot have 3.56 fan blades or 3.56 pump vanes. More than 4700 rules exist for machine faults. These rules are based on analyzing patterns seen in rotating machinery, and are built into the diagnostic engine in the Fluke 810 Vibration Tester. The most common faults are unbalance, misalignment, looseness, and bearing failures. 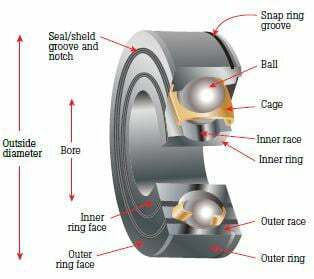 The nine stages below show pattern changes as bearing wear progresses. 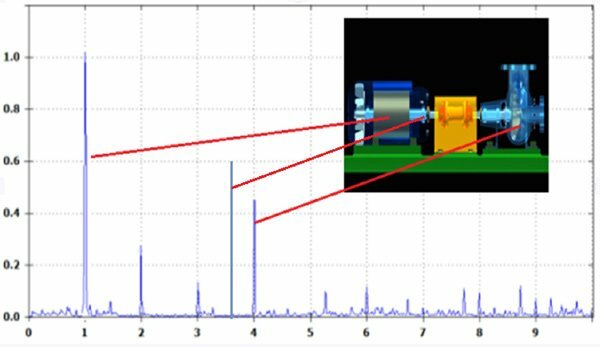 How does a vibration analyst find bad bearings? The analyst first looks at the complex waveforms. It takes years of training in waveform analysis and years of experience to do this. Another technique exists, but it is time consuming: Contact the bearing manufacturer and get a table of the bearing frequencies. Then you can overlay the frequencies to see whether they line up with the non-synchronous peaks that you find in the data. If they line up, then you have found the bearing fault. If they don't line up, you probably have a different bearing than expected. If that is the case, determine whether someone replaced the bearing with one from another vendor without updating the maintenance records. An analyst screens a pump with a Fluke 810 Vibration Tester. 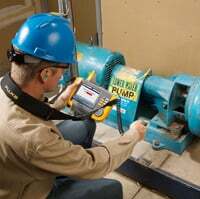 When you move up to a vibration meter, you have the capability to measure overall vibration in addition to specific variables. 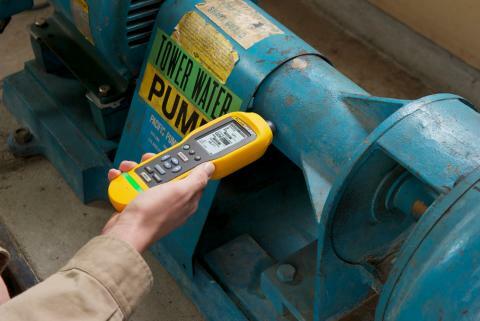 The Fluke 805 Vibration Meter has a combination vibration and force sensor tip that compensates for user variance (force or angle) - yielding accurate, repeatable readings. This meter has a four-level severity scale and onboard processor that calculate bearing condition and overall vibration using easy-to-understand textual alerts (Good, Satisfactory, Unsatisfactory, Unacceptable). Its sensors can read a wide range of frequencies (10 to 1,000 Hz and 4,000 to 20,000 Hz), covering most machine and component types. The 805's straightforward user interface minimizes user inputs to RPM range and equipment type. 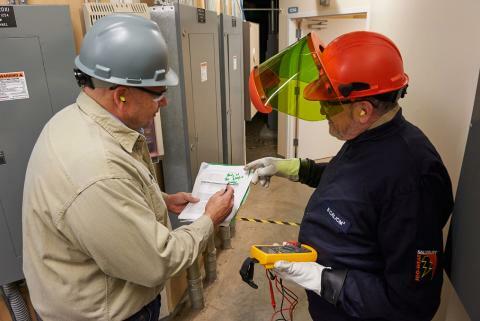 This gives frontline maintenance personnel and operators a screening tool to determine which equipment is healthy and which needs further troubleshooting. 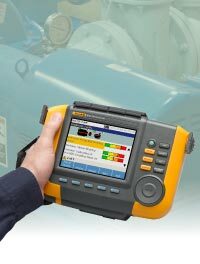 As described previously, an advanced vibration testing tool, the Fluke 810 Vibration Tester, has a diagnostic engine that combines algorithms with a database of real-world measurement experience.